I’ve just received an email from ShopandCrop.com.au regarding how we as crafters may be able to help some of these folks restore their memories at a later date. As we all have read recently and seen splashed all over our television screens, the victims here are many and varied, most have lost their entire homes, whole towns have been razed to the ground, more unfortunate folk have lost everything, their husbands, their wives, their beloved children, their Mother, their Father, their brother, their sister, etc…. 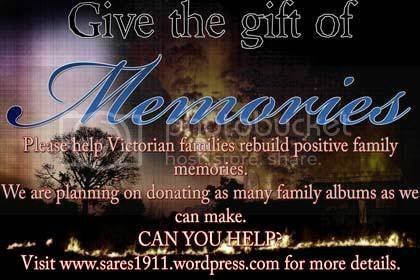 Here is a marvellous way we can help out in a way that crafters know how ….. complete an almost finished page, which when the time is appropriate will be forwarded on to the victims of these tragic events of the last week here, allowing them to start rebuilding their own precious memories that have been lost to the fires. Here is the link to Sarah’s Blog for further information. All help here would be greatly appreciated, I myself will be doing as many as I can for this cause. I know I would be completely devastated to lose my photographic memories, let alone the people in my life that are the subject. This entry was posted on February 12, 2009 at 8:24 am and is filed under Uncategorized. You can follow any responses to this entry through the RSS 2.0 feed. You can leave a response, or trackback from your own site.